Figure 2. Figure illustrating REIMEI’s simultaneous observation of auroral emission and auroral particles. From the orbit of the about 630kmal altitude, the aurora camera takes spectroscopic images of the 2D profile of auroral emissions with high spatial and time resolutions. At the same time, the auroral particle sensors measure energy, velocity direction, and flux of electrons that pecipitate along geomagnetic field lines into the ionosphere from the magnetosphere, and ions flowing upward to the outer space induced by the auroral phenomenon. In addition to optimization of each instrument, REIMEI’s attitude-control capability allows us to observe simultaneously auroral emissions and their related space-plasma phenomena with high spatial and time resolutions (Fig. 2). With REIMEI, simultaneous acquisition of data on aurora images, particles and environments with high spatial and temporal resolution becomes possible for the first time. There is no similar mission in the past and future in Japan or abroad. Since REIMEI flies at an altitude of 620km to 670km in the sun-synchronous orbit on the meridian plane at local time of 0:50 to 12:50, it can perform repeated observations (up to 30 times a day) of the southern and northern polar regions in mid-night where auroras appear frequently. 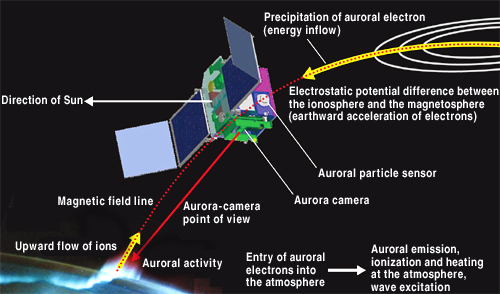 Furthermore, if field-of-view of the aurora camera is pointeddirected, by using the capability of the satellite’s three-axis attitude-control system, to auroral emission regions where co-observations are made from multiple points on the ground, we can take aurora images from various angles from the satellite and the ground. This provides us with useful data for the study of the auroral 3D structure. Space-plasma particles such as auroral electrons are stored in a region called the “plasma sheet” in the earth’s magnetosphere, where the plasma temperature is higher than tens of millions deg. of K (Kelvin) although its density is relatively low. The electrons rush into the earth’s atmosphere in a spiral motion around geomagnetic field lines that connect the plasma sheet with the earth, and collide with the earth’s high-density atmosphere in the ionosphere at an altitude of 100km to 500km, and the emissions are released. These lights are auroras. As the auroral electrons enter the ionosphere and near the ground, magnetic field strength increases. Under this situation, the electrons are reflected by the geomagnetic field and return to the plasma sheet, causing no auroral emissions. For the electrons to reach an altitude low enough to cause auroral phenomena, a downward (i.e., to the ground) acceleration process is required along the geomagnetic field lines. The most likely candidate for this mechanism is electrostatic potential difference along the geomagnetic field lines. It is thought that a potential difference of thousands of volts exists widely, extending to tens of thousands km in altitude over the aurora-emission region, and fluctuates actively. In addition to the auroral emission, the energy inflow carried by the precipitating auroral electrons heats the atmosphere and excites plasma waves, and sometimes induces upward flow of ions in the ionosphere. When their upward speed becomes high, the ions escape from the earth’s gravity to flow out into the outer space.